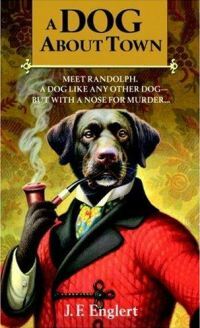 On the first page, Randolph, the Labrador retriever “with a nose for murder”, establishes himself as the first-person narrator, an intellectual and erudite – and rather garrulous - dog; moreover, as a dog who is hiding his intelligence from his owner, Harry, and other humans. We quickly learn, in this first of Englert’s three A Bull Moose Dog Run Mystery novels, that they live in central Manhattan, that Randolph is overweight, that the clueless Harry is oblivious to what goes on about him, and that Randolph’s real owner is Harry’s lover Imogen, who has been missing for a year. Harry has taken up spiritualism to learn what happened to Imogen, which Randolph has dismissed as futile but harmless. Lyell Overton, a literary poseur and the victim whose mysterious death begins this case, was at a séance to which Harry received an anonymous invitation to attend. Randolph remembers that Overton was mentioned cryptically in Imogen’s last diary entry, so he starts to investigate to learn whether there is any connection between what all the séance attendees assume was Overton’s fatal heart attack, Harry’s strange invitation, and Imogene. The Bull Moose Dog Run is an enclosed expanse of dirt and pebbles beside the American Museum of Natural History and in the shadow of the great glass box that is its Rose Center for Earth and Space. I am comforted and inspired by this edifice to the shear [sic.] empirical boldness of our continuing leap into the stars. […] Owners and their pets come to this dusty pen in great numbers throughout the day. Temporarily liberated from the leash law, a ragtag bunch of my kind – purebreds and mutts – scamper, sniff, chase and nip their way around the run. The dog in question had sidled up to Michael. My tail wagged in apparent greeting, but my nose was in overdrive. Michael was shedding heavy doses of fear, anxiety and suspicion. Michael didn’t like seeing Harry in the room, not at all. The rank of suspects is eventually diminished by a second death. Finally, the killer is revealed, and Randolph and Harry return to their status quo. A Dog About Town is a curious murder mystery. It works well enough, but it is too much the intellectual puzzler with too little suspense. This is due entirely to Randolph’s leisurely narrative style. The book could be cut in half without Randolph’s wordy digressions. They are witty enough to keep the reader’s attention, but bring the plot to a halt every few pages. The abbreviation above in the description of the Bull Moose Dog Run is because Randolph’s full word portrait of it and of the dogs to be found there goes on for five pages. Randolph is incapable of entering a new scene without describing it, usually unnecessarily for the plot, at great length. The reader gets graphic descriptions of NYC locales and the suspects, real and fictional. You can tell a lot about a dog by the way he or she approaches a Number 1 and a Number 2. Randolph himself feels embarrassed at having to relieve himself in public, but this is the price he pays to maintain his disguise as a normal dog. Ho, ho, and could we get back to the mystery? A Dog About Town is an enjoyable read if you don’t mind extremely laid-back storytelling, a conveniently dense human cast, and an interesting but unexciting plot. In his Acknowledgements, Englert thanks “Dan Craig for the superb portrait of Randolph in his smoking jacket”. Yes, it is worth admiring.